Our biggest blog post of the whole year is here! We want to share the Fount Workshop with you all! Recently this past May we hosted our second workshop for photographers of motherhood. Our venue this year was the beautiful Serenbe Farms located just outside of Atlanta. This workshop was born out of a desire to provide a workshop experience unlike any other- and entirely focused on motherhood photography. Tiffany Farley – Founding Editor of The Fount Collective, Photographer. Abany Bauer– Stylist, Art Director, and Owner of Brown Linen Design. Shanna Skidmore– Business Coach, Financial Strategist and founder of The Blueprint Retreat. We absolutely adored our venue this year. Serenbe allowed us to provide an all inclusive stay, and it added so much to our mission for cultivating personal community during this experience. The grounds were so beautifully landscaped, with no detail left untouched. Hosting our workshop at Serenbe also provided us with the ability to create styled, portfolio building concept shoots both indoor and outdoor- giving us a beautiful variety to work with. We had perfect weather- although the few of us from the north may have argued that it could have been a little cooler! One of our favorite parts of the post-workshop experience is celebrating the photographs that were taken by our attendees and sharing favorites here with you on the blog! From photographs of the beautiful Serenbe landscape, to behind the scenes, to their new portfolio images from the styled shoots- we are so thrilled to share them with you here today. Our workshop is for both film and digital photographers- whether brand new or seasoned. We welcomed photographers from all over the country this year, some just starting out in business, some well seasoned, and even returning alumni from our first year! It was such a joy to put together this blog post for you all, as it allowed our team to relive the workshop through the eyes and perspective of our wonderful attendees- something that is not often seen when the planning and leading is taking place. We love that the images in this post are from photographers who create with their own unique style, eye, and presentation. “…How does one sum up the memorable experience of the Fount Workshop? It started with Tiffany greeting us and saying “We are for you”, and from there it instantly became an experience that will never be forgotten. Even a month later, I still think back to the teachings, techniques, conversations shared, and overall feelings of nurturing, resetting, growing as an artist, and meeting the most wonderful group of women photographers in the industry. If you are a photographer looking to deepen your work, to find the place you come from when photographing families, couples, motherhood, and is someone who feels inspired within a smaller, intimate setting of friendship and community, then the Fount Workshop was created just for you. There was not a single detail missed and I felt pampered, well-cared for, and spoiled in this experience from start to finish. After attending the Fount Workshop, you will walk away a better version of yourself as a person, as an artist, with new friendships, and is hands down one of the best investments I have made for myself and business so far. It was a valuable experience and I’m so thankful to all the efforts and details that went into making the Fount Workshop so fabulous!”– Anne Miller. We were privileged to work with such generous sponsors who helped to make our attendee experience so special. Blanche Prints gifted each of our attendee with one of their gorgeous French Velvet Proof Print Boxes. Our attendees have already since raved about ordering them to use in their brand and business after returning home. “…I am so glad I attended The Fount Workshop. I left with inspiration and practical business ideas. The workshop also allowed me to think about family photography in new ways and gave me the opportunity to refine my work through beautifully curated styled shoots. Tiffany, Rylee, and Abany create an atmosphere that is inviting to questions and reflections. I felt like I was at a wonderful soiree the whole time. It truly was an incredible experience and the best workshop I’ve been to.”-Diana McGregor. “…After being in business for many years, I wasn’t looking for a workshop that spoke to the technical aspects of photography. I was looking for an experience that connected me as an artist to my art on a deeper level. I found everything I was searching for at the Fount Workshop. Held at the magnificently beautiful Serenbe in Atlanta, you can’t help but be inspired. Around every corner of the neighborhood there’s thoughtfully planted herbs and florals, while inside the decor is fresh, white and chic (basically a photographer’s paradise!). Personalized gifts and thoughtfully laid out printed documents were the icing on the cake. The styled shoots and break out sessions with guest speakers, Shanna Skidmore and Michael Howard were a perfect addition. The opportunity to connect with a room full of other like minded women was also particularly special. Tiffany, Rylee and Abany planned every little detail to make this experience magical. Their hearts and souls came out in their presentation of this very well thought out workshop!” – Meghan Campbell, Soli Photography. Our incredibly talented Hair & Makeup artist, Molly Stilley, was also expecting, and joined us for both an indoor and outdoor maternity shoot. We wanted to share with attendees different ideas for photographing pregnancy in a more intimate bedroom setting, as well as outdoor in the golden sunset light. Molly beautifully wore outfits from Free People for both of her shoots. “…The Fount Workshop at Serenbe was a breath of fresh air! From the relaxing venue, heart-felt teachings, stunning styled shoots, generous attendees, and the welcoming workshop team it couldn’t have been a better spent week for me and my business! Taking time out of your schedule, and getting out of your office and routine is imperative to your success as a business owner, especially when you invest in education that is right for you. The Fount Workshop couldn’t have been a more perfect fit for me as an artist and business owner. Rylee, Tiffany and Abany poured their hearts into creating a dream workshop for Motherhood photographers and challenged us to dig into our purpose behind our business. If you’re at a point in your business feeling like you need to be refreshed, inspired, and to stretch your knowledge, don’t walk but RUN to get your spot, I know I will be! I can’t wait to come back!”- Emily Gerald. “…Before attending the Fount Workshop, I was at a crossroads. My passion for my art was waning as I struggled to maintain enthusiasm for running a business and balancing responsibilities of new motherhood. I honestly cannot express how much the workshop reignited my creative fire. I left feeling rejuvenated, inspired and committed to take my business to the next level, and, more importantly, was provided with the tools to get it there. Moreover, the workshop experience forged truly unforgettable connections and relationships with other like-minded artists in the industry. I will treasure the experience forever and would return in a heartbeat. Worth every penny (and then some! ).” – Kayla Piskuliyski of Kayla Poole Photography. “…I am so THANKFUL I chose to invest in the Fount Workshop! When I attended the workshop, I was six months into my photography career. I have to admit that before arriving I was nervous to be around so many professional, experienced photographers. But those nerves were easily swept away the moment I walked into the door and had the honor to get to know these ladies. Both the speakers and the additional attendees were always willing to help if any questions came to mind. They easily explained the process behind their approaches in an understandable manner that I know I can apply to my business. After two days of beautiful shoots, a serene atmosphere, and tons of learning, I walked away feeling inspired and ready to grow my photography business into something more!”- Ashley Landry. It is really important to us at this workshop to honor different styles and methods of photographing. We wanted to provide attendees with a bit of variety, and perhaps a special scenario that they may not normally have the opportunity to shoot. For this concept, we set up a lifestyle scene for this mother & son for an in-home feel. The shoot was envisioned, styled, and given creative direction by Abany Bauer and Rylee Hitchner. Sunny wore a Cloth & Stone Utility Shirtdress from Anthropologie (currently available for resale, please inquire for details) and her son wore his own clothing. The beautiful, handmade wooden blocks we incorporated into this shoot were provided by Felix Glenn. Our final shoot was of the sweetest Mother & Daughter duo, photographed on the beautiful grounds and gardens of Serenbe. We even incorporated one of Serenbe’s baby goats for part of the shoot! 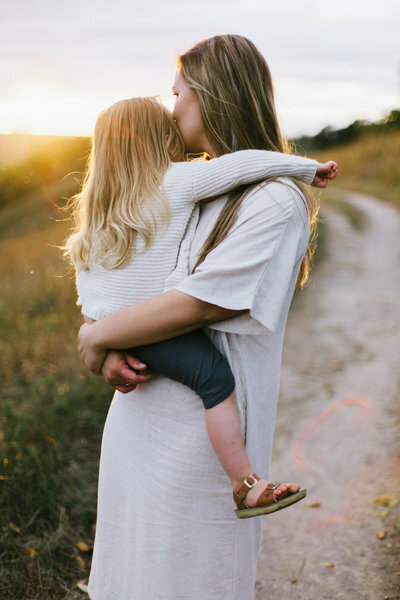 Kallie wore a Free People dress, and her daughter wore a Maude Playsuit from Soor Ploom. (both currently available for resale, please inquire for details) The shoot was envisioned, styled, and given creative direction by Abany Bauer and Rylee Hitchner. “…I came to the Fount workshop with high expectations, and they were all exceeded! There could be no question that every detail had been thoughtfully planned, and the heart behind it all was to inspire us as artists. Everything was given to us with grace and generosity….teaching that went beyond technicalities and reached deeply into our artist hearts, beautifully styled motherhood shoots, and tangibles like sweet gifts, delicious food and luxurious printed materials. I left feeling valued and inspired!” – Amy Smith, Sweet Caroline Photographie. An additional note from our founding editor Tiffany Farley | I would like to give to a huge thank you once again to everyone who made this workshop possible- from the ever talented vendors, our incredible creative team, our kind and generous sponsors, our guest speakers, and to each and every attendee who made all the time and planning to make it happen absolutely worth it. You all made this one of the most fulfilling creative endeavors of my entire year. Thank you! If you would like to be the first to hear of future educational and workshop opportunities be sure to subscribe to our mailing list!